This book provides a refreshingly rational guide to the many issues involved in psychological assessment, taking dyslexia to be a remedial cognitive deficit. The author reviews the major tests in use for children and adults, while keeping the scientific purpose for their use firmly in view. Written primarily for assessment professionals, the book will appeal to parents and specialist teachers and all those with an interest in fair and objective methods for dealing with dyslexia. Martin Turner is the Visualization Team Leader within Research Computing Services at the University of Manchester. He gained his PhD in the Computer Laboratory, at Cambridge University. His research in visualization and image processing has resulted in a Fellowship with British Telecom, a published book, Fractal Geometry in Digital Imaging as well as over 50 other publications, and he has supervised to completion seven successful MPhil/PhD students. Key activities and grants cover both local and nationally funded high-end visualization services as well as commercial contracts. Chapter 2 The Concert of Abilities. Chapter 3 Describing Individual Variation. Chapter 4 Detecting Cognitive Anomaly. Chapter 5 Charting Individual Attainment. Chapter 6 Structures for Reporting. Chapter 7 Recommendations for Specialist Teaching. Chapter 8 Analysis of a Casework Sample. Chapter 9 Testing for Teachers. Chapter 10 Assessment of the Younger Child. 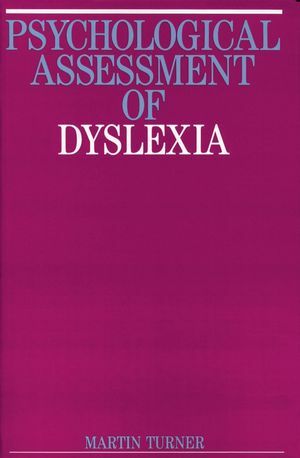 Chapter 11 Assessment of the Dyslexic Adult. Chapter 12 Severity: The Case for Resources. Appendix 1: Key to Abbreviations for Tests Used. Appendix 2: A Select Bibliography of Literature on Direct Instruction. Appendix 3: Table of Normal Distribution Values. Some of the Rare Literature that Objectively Evaluates the Effectiveness of Teaching, Specialist of Otherwise.